It’s our 10th birthday! And to celebrate we’d like to invite you all to our birthday bash, The BRICKFEST, 16th June. We’ve got tonnes planned for our festival, including live music from; The Quaintest show on earth, a fantastic alternative folk band from Wigan. Their entertaining live show, is sure to put you in spirit for a party, featuring both original material and new takes on classics. Whilst you’re watching our fantastic live music, why not enjoy our brilliant selection of homemade cakes and sweet treats. Featuring all your favourite baked goods, it’s sure to be a delicious day out. 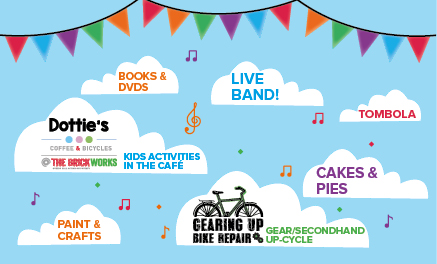 Or if you’re not fancying something sweet Dottie’s café will be open for the full event, to provide you with refreshments and selection of Breakfast and lunch items. Keep the Kids entertained this Saturday with our wide variety of family friendly activities; you can try your luck at winning a prize on the coconut shy or have a go at our amazing arts and crafts stall, we’re also offering face painting and playtime in our custom made kid’s kitchen. The Brick is giving you the opportunity to win many great prizes at our Tombola, such as a luxury sofa, pub meal tickets and retail vouchers worth up to £40! The opportunities don’t stop there as we’re selling loads of DVD’s and books for just £1 to keep you and the family entertained for days. The BRICKFEST will also be featuring our very best bespoke crafted furniture, which will all be available for sale at amazing prices. Our bike shop will also be open to provide, bike maintenance and repairs. We’re also offering a FREE bike MOT to all visitors. 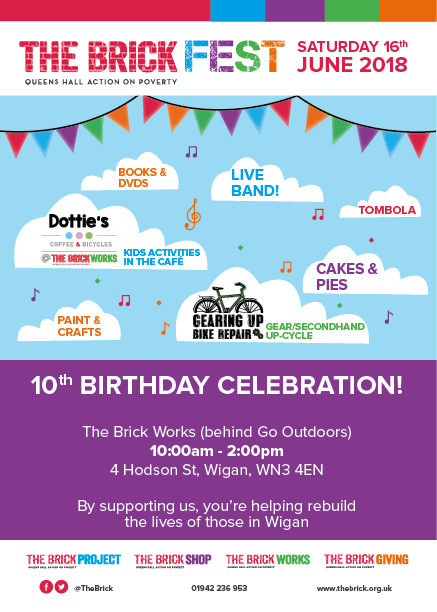 So come down and enjoy our birthday celebration at the Brickworks, 4 Hodson St, Wigan WN3 4EN, form 10:00am – 2:00pm. Parking available at the Trenchfield Mill.